How do you track whether your intranet is succeeding? In his workshop at the 2018 Intranet Now conference, Lindsay MacVean, Invotra’s Analytics Product Lead, explored how we measure employee engagement in a connected workplace. What does success look like to your organisation – what goals have you set or been tasked to improve? Your goals may have intentions such as giving users a stronger voice and control over content or may strive to drive innovation via generating ideas. 2. Achieve 1:1 gig worker to internal staff comment rate in order to improve engagement of ‘gig’ workers. We have customer tools such as Matomo and Google Analytics combined with server logs/queries like MySQL. And what are the dimensions of the capture points? Do your capture points give the dimensions needed to measure progress towards your goal? e.g. Number of employees/gig workers, comments per user. How are you helping to achieve your organisation’s story? 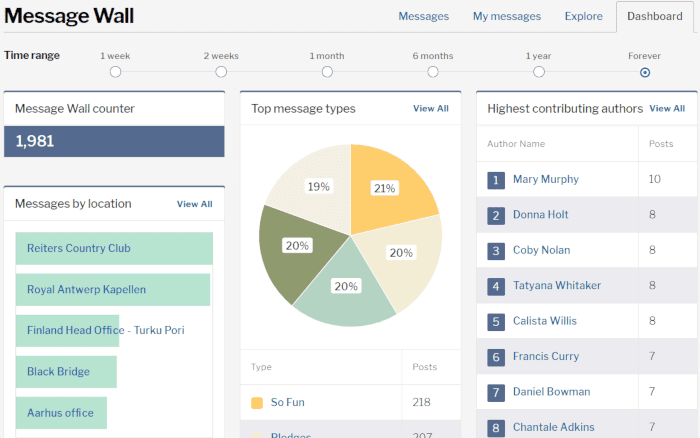 You can use a custom, dashboard or business intelligence report. Whatever works for you – aim to focus on the signals and not necessarily just the noise at some regular interval to show change. You can tell your intranet story via a report and demonstrate how it helps towards your digital, communications or HR goals such as boosting employee engagement.